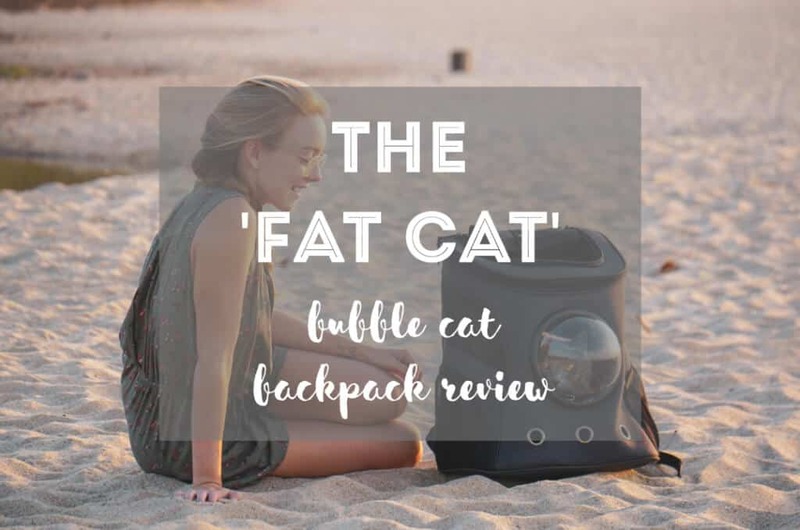 We are beyond excited to share with you our Fat Cat Backpack review, kindly sponsored in partnership with Your Cat Backpack. This article reflects our 100% honest opinion and experience using The Fat Cat! Check it out to learn more. Thank mew! To start off our Fat Cat Backpack review, we just want to say thanks for all your support! Your comments and engagement with us make doing these types of sponsorships worthwhile. 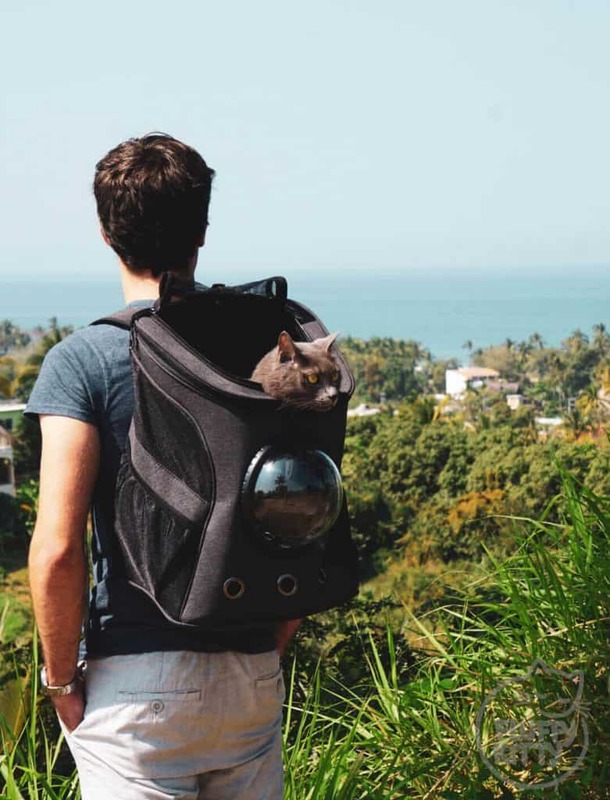 We wanted to test this amazing travel cat backpack since, after all, we regularly travel with our cat!! It’s exactly the genre of cat products we want to test and share with the world and our faithful Fluffy Kitty followers! So without further adieu, here’s our complete Fat Cat Backpack review (along with our homemade Fat Cat review videos)! All right, so our first impressions of The Fat Cat was “Oooh” (literally). The material is of very high quality, there’s no doubt your cat can ride around safely in the Fat Cat backpack. Yoda heard us rustling around and came out to the living room to check out what we were up to. He starts sniffing and poking his head in the holes. It’s like he knew it was for him! The three words we would use to describe The Fat Cat backpack best are: sturdy, secure, and stylish! The backpack is also spacious for most large-sized cats. The Fat Cat can hold up to 19.8 lbs, so even larger cat breeds can enjoy a ride on your back. A harness clip so your cat can hang out/pop their heads out safely (our most loved feature!). Two mesh pockets on the sides for storing water bottles, treats, harness/leash, etc. A comfy and sturdy mat to support your cat. Breathable holes on the bottom front, plus breathable mesh on upper sides and top. A clip to hold the mesh in place if your cat wishes to ride with the “top down.” (For “charcoal” style Fat Cats only). A chest clip for extra support (if needed). Adjustable, padded straps (and the backing of The Fat Cat is also padded which makes it super comfortable). Moreover, The Fat Cat backpack is easy to carry and is more lightweight than we had imagined. Carrying Yoda (who weighs 4.5 kg/10 lbs) felt natural and comfortable. So there are our first impressions! Now, let’s move on to Yoda’s first time using The Fat Cat around town and on our weekend hike. But not to our surprise (#humblebragging), Yoda took to The Fat Cat so easily. He really is our little world traveler! Of course, he will get spooked at loud trucks or unexpected noises (he’s not supercat). We go outside and start walking. Yoda’s looking around, balancing himself as Paul walks. He isn’t hiding away at the bottom of the backpack (which tells us he’s curious and comfortable). Some people notice, others don’t, which is what we also love about The Fat Cat. With the bubble attachment, you can be more noticeable and with the hard mesh, you can be more stealthy. We walked from our apartment to the beach, which is about a ten-minute walk. We passed loads of cars, people, restaurants with music, and so on. Yoda was free to pop his out head if he wanted or not! On the way, it was quite cute to see him bobble up and down as he felt more comfortable and/or as he needed to hide away from a big, bad scary truck. We finished our little adventure at the beach for sunset. Yoda was less willing to pop his head out once on the beach because of the waves crashing on the shore (he really doesn’t like that chhsssssssss sound). In this case, he just laid down and was still able to check out the world via the bubble. After a successful first trip, we’ve since hiked with Yoda to a panoramic vista of the coast, downtown to run errands, and to the gas station on foot! We want to stress the importance of knowing your cat well before going out on an adventure together. It might seem fun (and cute) to carry around your cat, but as we have discovered recently, there are dozens of cat owners who willingly make “cat backpack videos” at their cat’s own expense. While traveling with your cat IS POSSIBLE, it is not for all cats. To keep this short and sweet, there are lots of pros, and not so many cons about The Fat Cat. But we have some tips for improvement. Our main reason for loving The Fat Cat backpack is simple: It fulfills our need for a designated travel cat backpack carrier for Yoda. Before having The Fat Cat, we weren’t able to take Yoda on hikes or trips around town (one time we took him to the vet in my regular backpack and he liked it a lot, but it wasn’t ideal for adventures). As much as we love The Fat Cat, there’s always something that could be improved. Here’s our “cons” list of The Fat Cat. The harness clip (while our favorite feature) tugs on the cat’s harness a little if your cat lies down. Tightening the rim can be a little tricky so make sure to secure it properly (Yoda once pushed on the bubble too hard while walking and it popped off). It is an investment (at $119 value), so make sure you and your cat will use this backpack before buying. But we can say this: If your cat likes adventures, then The Fat Cat is the way to go. Don’t opt for a smaller size. Your cat could always use the extra space! The backpack made our backs a little sweaty, especially on hikes. 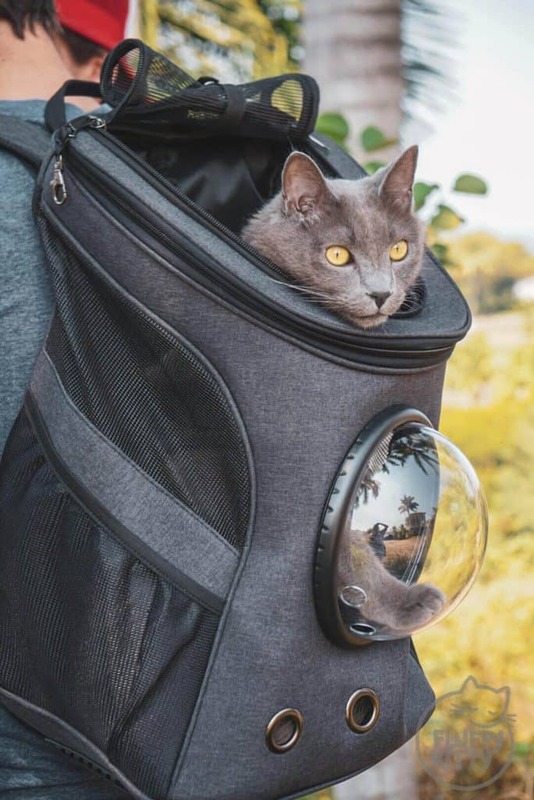 It would be great to see a future model with incorporated mesh on the backside of the backpack to allow your back to breathe (and produce more airflow for your cat). Yoda relied on “standing up” to see out the top of the backpack, which can get tiring, and which is why he used the bubble attachment as a ledge for his paws (which is what contributed to it popping off with his weight). Maybe it would be cool to have some sort of incorporated ledge or insert for cats to rest their paws? 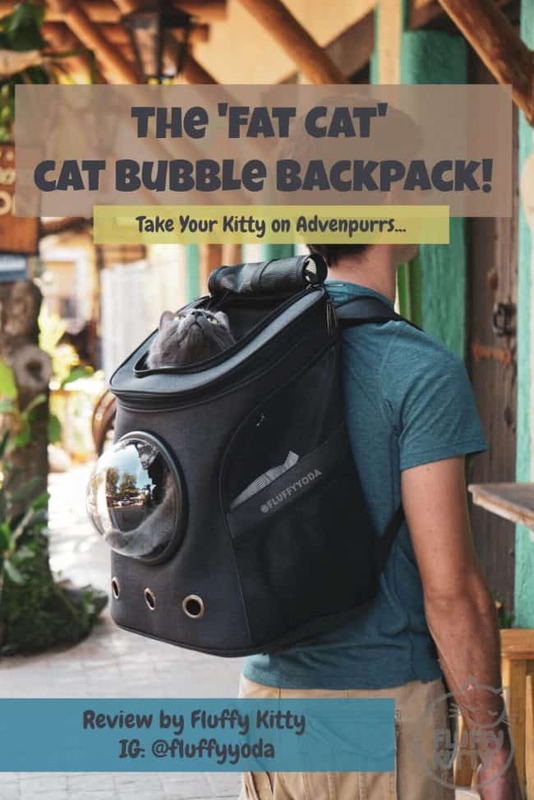 We want to wrap up this Fat Cat backpack review with just a few tips about the Fat Cat and traveling with your cat. Firstly, just because a product might be great, accidents can happen! Make sure to avoid any mishaps by tightening the rim securely before heading out on an adventure. Secondly, make sure to monitor how your cat is doing frequently. Check for panting or heavy breathing, signs of stress, and so on. If your cat stresses and loses their bladder or bowels, it’s probably not a great idea to keep carrying them in a backpack. Lastly, ensure your cat’s harness and leash is well-adjusted. If your cat wiggles out of it, even the harness clip won’t prevent your cat from jumping out. As we briefly mentioned, traveling with your cat isn’t for everybody. It truly depends on your cat’s purr-sonality. Always consider the safety and comfort of your cat when on adventures. If your cat seems uneasy or distressed, always be able to adapt your travel plans and cut your trip short. Start small. Plan very short trips with your cat to ensure their familiarity with riding in a backpack before attempting to go on a 2-hour hiking trip! 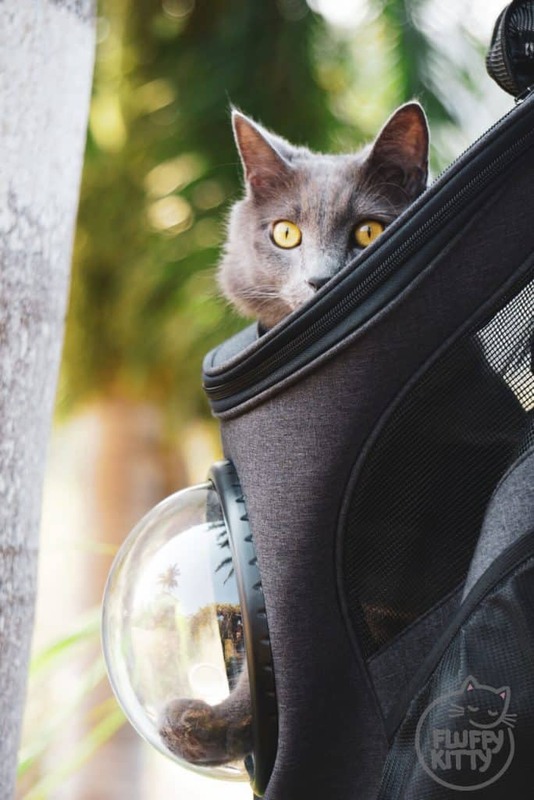 We are personally looking forward to writing about longer adventures with Yoda on the blog, including traveling in the plane cabin with our Fat Cat backpack. We are always here to answer questions should you have any! Where to Get Your Own Fat Cat Cat Backpack! Did you fall in love with The Fat Cat as we did? Then meow’s your chance to get your own! Otherwise, if you miss the chance of winning a free cat backpack, we still offer our readers SPECIAL DISCOUNT CODES! U.S. customers already benefit from free shipping. “FLUFFYKITTYSHIPPING” = FREE SHIPPING for customers outside the U.S.
Wow, congrats on making it to the end of this article! Thanks so much for reading our Fat Cat backpack review! 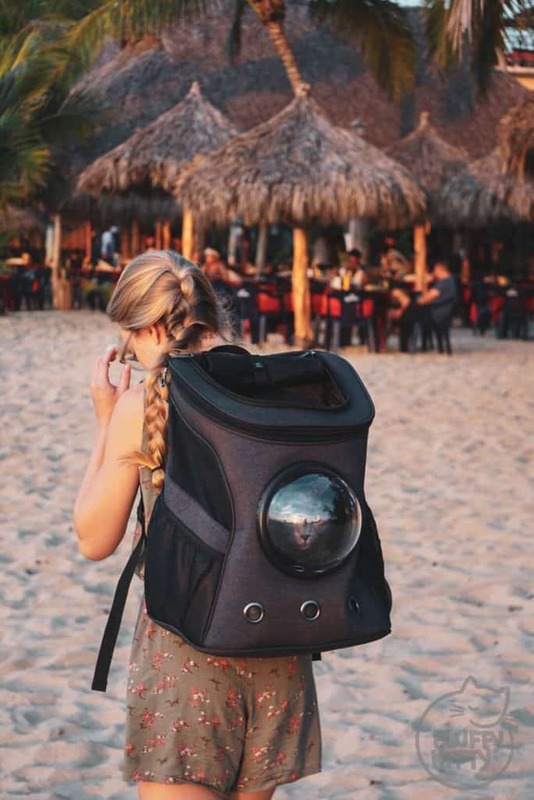 We are in love with our new adventure cat backpack. 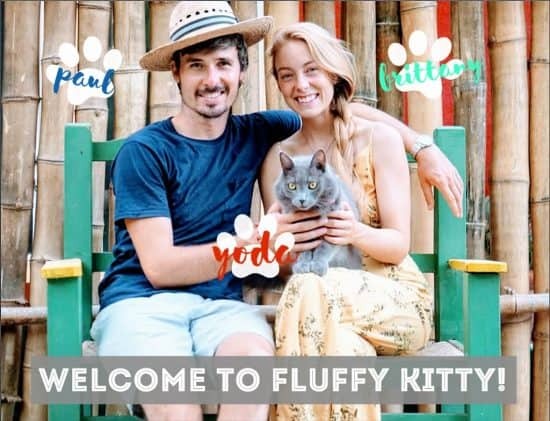 We will be able to make so many new memories traveling with Yoda thanks to Your Cat Backpack. Overall, we highly recommend trying The Fat Cat backpack by Your Cat Backpack!! 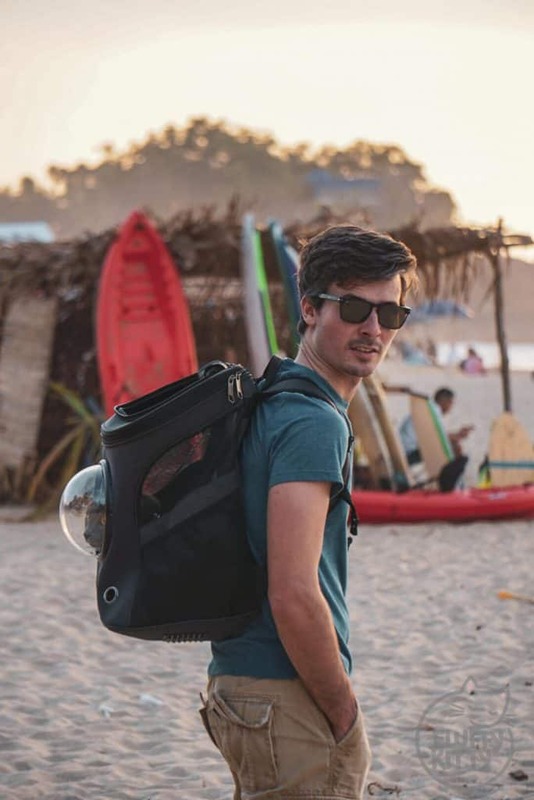 If you enjoyed this Fat Cat backpack review, do let us know! Share your thoughts and comments below. 🙂 If you think we missed a detail or would like more explanations, feel free to reach out. Having a pet can bring people joy because of the companionship and the love pets give their owners. However, taking care of a pet is a big responsibility because certain pets have very specific needs that pet owners should cater to. Some of these needs may include specialized cages, special diet or grooming. Yes, some of that may be true (not sure of the cages part…?). Also not sure how that relates to this cat backpack, but thanks for sharing your thoughts anyway.